It is written … by hand. Since stepping down from management in October 2012, I have come to enjoy my days at work much more, but then it’s only natural, since I’m doing a three-day-week now, and it’s stress-free. If I’m on a break while at work, I will invariably still produce a passage for my current story, which I then type later in the day. I take pride in my handwriting, so apart from the ‘creative’ writing side of it; I actually enjoy handwriting. Working in a stationery store means that customers regularly ask to try out pens, or wish to compare one with another. Some customers have been so ashamed of their own handwriting that they prefer somebody else to test the pen. Whenever I’m asked to do this, I always write a word or two, because it’s the only way to appreciate the line produced by the pen. Following many short conversations with customers, I’ve decided to go ahead with the idea of producing a step-by-step, handwriting tutorial on my website. It will deal with the basics, like; types of pen, holding a pen properly, tips on handwriting, and how to produce a neat and legible style. If your curiosity should get the better of you, please click along to my site and check out the idea. As with all my blog posts and work on my website, I appreciate feedback. Tomorrow I will be setting out how to write the first few lower case letters, and I’ll be using a simplified Copperplate style. I always plan by hand as I like the fact it makes me go slowly, but I almost never write by hand. I did teach myself shorthand a couple of years ago for fun though, and i do write letters by hand. I have a friend who I’ve been writing to since we were six years old. Handwriting is definitely a dying art. At university we HAD to do all our essays and assignments on the computer then had to do three separate three hour hand-written exams in a day and a half – it was so painful! Thank you for dropping by Chloe. I like the idea that it makes you go slowly, which for planning, has to be a good thing. I think a handwritten letter is so much more personal than typed, because apart from anything else, the recipient knows you’ve put some effort into it. The thought of you and your peers having to write exams brought a smile. See I like my handwriting, and I’m quick when I write with a pen, but my ideas just don’t flow in the same way as when I type. I suppose it’s because I learned to touchtype in my teens, and so I can type and think virtually simultaneously. Also it’s easy to alter mistakes on the screen without looking messy. Having said that, I prefer to note down ideas in pen, and I also like to annotate my first draft in pen before re-writing. It’s all about what works best for us I suppose. 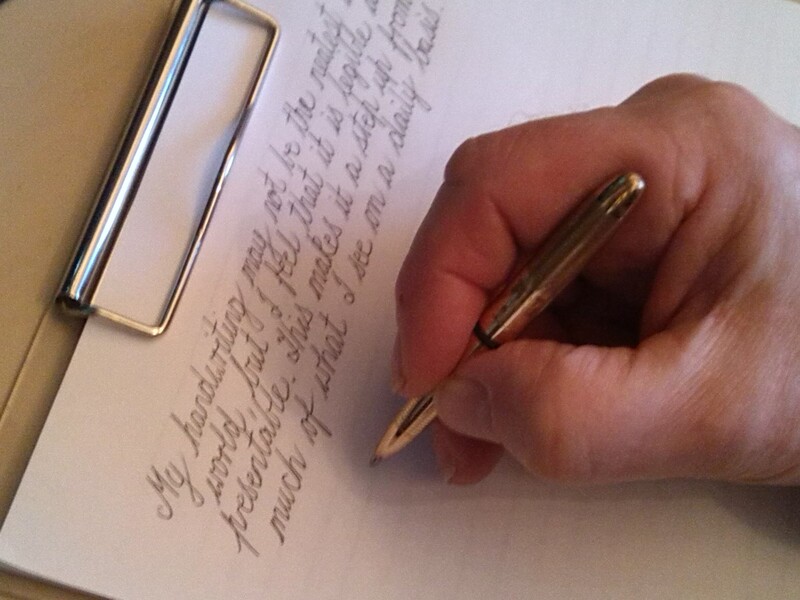 As much as I enjoy writing by hand, I do have to agree, that tapping away with the keys is more efficient when relating the efforts to time, corrections / editing. I also learned to touch-type many years ago, and I have to admit it is a real bonus if typing up handwritten passages I may have produced at work. I do a ‘red pen’ edit on hard copy, but, like you, I like to make notes by hand.